DOOG Super Sticks are designed as a tougher version of the original Stick Family. These guys aren't afraid of a bit of rough and tumble at the dog park. DOOG Super Sticks are made from durable, natural rubber. They are a much safer to fetch and play with and unlike a real stick will not splinter or damage your dogs mouth. DOOG Sticks float and glow in the dark for longer play time. 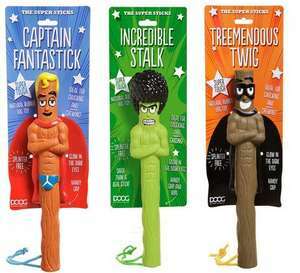 The DOOG Super Sticks come with glow in the dark eyes and a handy grip for grappling. The rope ensures you don't get slobbery hands and allows you to hang them at the front door ready for your next adventure together. The DOOG Super Sticks even float in water for added fetching fun with your furry friend. Note: Please don't leave you dog alone to chew his sticky friend as they are not designed for hard chewing, They are best used for fetching and playing only. No toy is indestructible, please supervise your pet and remove if worn or damaged.